My wife, Cathy, and I are in Kiev to bring home our daughter, Masha. We've been in Kiev a week and a half now. I should be home with our daughter by Memorial Day weekend. Most of what you are seeing in the news about Ukraine is happening south in Crimea, or east, along the Ukrainian-Russian border. There is still an Occupy movement going on in Kiev. There are still tents, shelters and barricades in Independence Square. The Square is at the bottom of a hill. It is the heart and center of the city. There is an underground, two-level shopping mall; and below that, is the hub of the city's subway system, Maidan station. 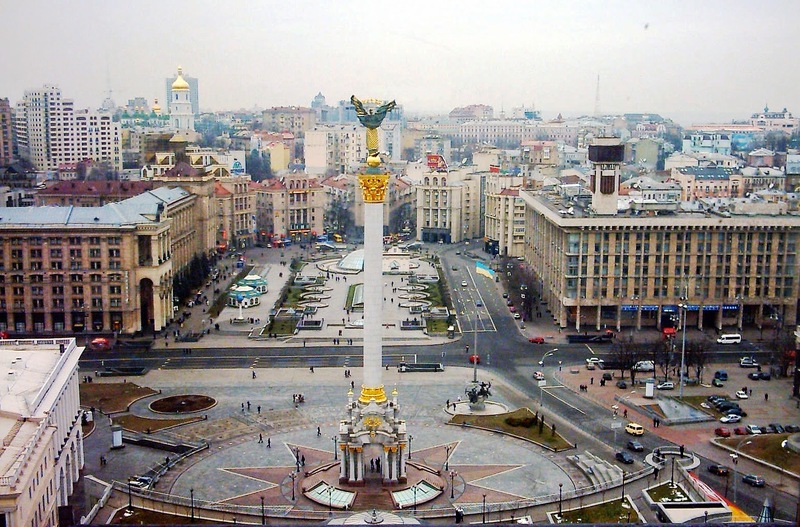 Maidan is one of the three Metro, or subway lines through the city. Maidan is the Blue line that runs north to southwest. There is another platform in the station for the east-west Red line. One stop south, there is a connection for the northwest-to-southeast Green line. At the top of the hill there is Parliament and the Ukrainian government offices. There is a cathedral outside Parliament, on one side and on the other a longer diplomatic academy building. In the parking lot for all three of these, there is the another barricade. 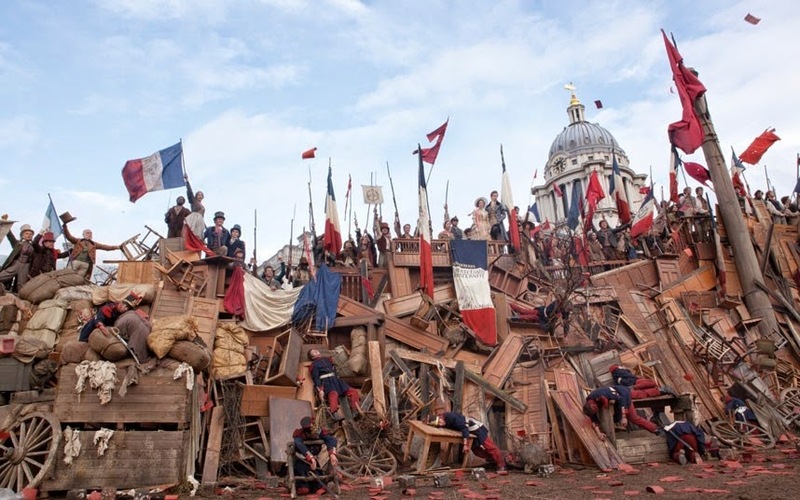 It is all very Les Miz. We're here just to get through the process of adopting our third child, a daughter, Masha. A week and a half here, and we are waiting for our court date on our motion to adopt. Ten days after that we will get our court decree approving the motion and then the final days spent here will be getting her new birth certificate, passport, visa from the U.S. Embassy and final physical before we head back home. It is a long and involved process that means an extended stay here in Kiev. This is the third time we have adopted from Ukraine. My wife and I have been chronicling our story on Facebook at Cathy and Dave's Adoption Journey. On our first trip, I had just picked up Geoff Johns and Jim Lee's first issue of The New 52 Justice League. I spent seven weeks re-reading that one issue, along with Alex Ross and Jim Krueger's twelve-issue opus, Justice. I brought the three softcover trade paperbacks. I was reading Eoin Colfer's Artemis Fowl series, and enjoying it immensely. On our second trip, Justice came along with again, along with six, seven or eight issues of Marvel's Avengers Assemble tie-in comic to the Disney XD animated series. This third, and final trip, the stack is a little larger. One of the books that I've brought along to re-read is on by a good friend of mine, Bill Halliar. Evilman Saves The World #1, published by Moonstone Books. I haven't read Deadpool, but I guess if you are fan of Marvel's Deadpool, Dark Horse's The Mask, Rob Schrab's Scud, The Disposable Assassin, Ben Edlund's The Tick and characters like that, then Evilman Saves The World is for you. Bill did both the story and the art for the book. In a nutshell, while eating breakfast, Evilman fends off an alien invasion with the help of his breakfast cereal. And, a small firearm. Free... inside his breakfast cereal. It is wacky and irreverent. Like The Simpsons comics, there is a gag in almost every panel. There is also a set-up and then a gag. So, it is almost twice the laughs in every panel. The reason I brought this along is I needed a good laugh. Evilman delivers. The first page has a bunch of good laughs. The paper Evilman is reading is called The Poop. Evilman is holding a coffee mug with the inscription "Caffeine is Life", while he is reading his morning paper. Called "The Poop". Did I mention already that the paper is called, "The Poop"? Evilman's breakfast cereal of choice is Yak Puffs, with a "FREE! Small Firearm Inside!" The front page banner headline of the paper - called "The Poop", y'know - reads "Macabre Moon-Monster Menace". I can only guess that is a nod to Mr. Nightmare's Wonderful World, another Moonstone Book, by Dave Ulanski. That's just the first page, and I'm hooked. But, that's just me. Evilman Saves The World is good for a laugh. That's what I need. These trips have been stressful. It is not easy being a foreigner in a foreign country like Ukraine, in a city like Kiev. I have great respect for the people here. I just need a little creature comfort from home. Like a sinister pickle. Seriously. 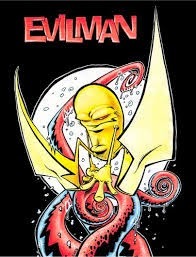 Evilman looks like a pickle with arms and legs. It's hilarious!